Creating a memorial garden helps you honor a special person, event or cherished pet, and gives you a place for reflection and healing. Thinking about the plants and other elements in the garden provides a way to stay connected with your loved one. What's more, being in nature among plants and animals connects you with the energy, joy and peace that remain in the world. A heart shaped rock printed with text in the grass. A garden bench or chair provides a spot in the garden for reflection. The seating doesn't need to be fancy -- just to provide a comfortable and inviting rest spot. If you prefer to meditate in motion, build a small labyrinth to walk around. Labyrinths range from elaborate stone and mortar creations to gravel or brick paths to simple, mowed paths between higher grasses. 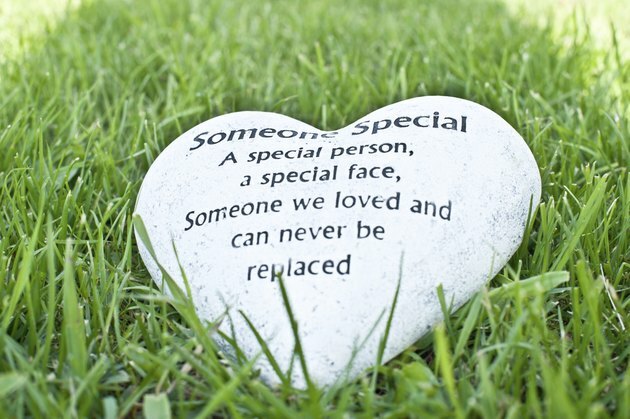 If you place something in the garden that reminds you of your loved one, the garden becomes more special. If the garden is for someone who loved birds or dogs, erect a birdhouse or hummingbird feeder on a nearby branch or place a ceramic dog on the ground next to a bench. For a hiker, erect a small rock cairn, plant flowers in an old hiking boot or use old hiking poles for flower stakes. An enclosure gives the garden boundaries and sets it apart from other areas of your yard. A space enclosed by a hedge or fence gives the most privacy, but a few strategically placed clumps of tall ornamental grass or one or two panels of low picket fencing work as well. If your garden space is very small, a simple plaque or change in paving can also set an area apart. An ornamental or favorite plant makes a memorial garden special. Choose a simple plant such as an easy-care "Knock Out" rose (Rosa Radrazz) for U.S. Department of Agriculture plant hardiness zones 4 through 9 or a scented lilac bush (Syringa vulgaris) for USDA zones 4 through 7. Or choose an unusual plant, such as a dwarf Japanese maple (Acer palmatum "Dissectum") for USDA zones 6 through 8. If you have ashes to scatter, mix them with Iceland poppy seeds (Papaver nudicaule) before scattering them in the garden in USDA zones 2 through 8. What Plants for an Italian Garden?